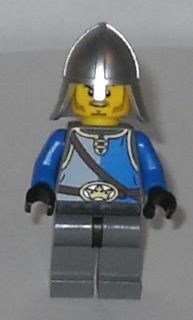 Gallant Guard is a minifigure in The LEGO Movie. He was physically released in 2014. The Gallant Guard has a yellow head like most of the the other minifigures from the The LEGO Movie theme, except for Batman and some other licensed characters. He has a printed black raised eyebrow and white pupils. He has a moustache and a beard stubble. He is wearing a metallic silver soldier helmet with a neck protector. His torso is mainly blue with a silver stripe. At the top of his torso and near the shoulders there is printed gold lining. He has a rope stretching from his left shoulder to his right hip. He also has a brown rope belt going with a gold crown buckle. His arms are blue and he is wearing black gloves. He has black hips and unprinted grey legs. The Gallant Guard is an inhabitant of Middle Zealand. He appears at the start of the movie guarding the chamber where the Kragle is hidden. He is very similar to the Castle minifigures released in 2013. This page was last edited on 12 January 2016, at 22:50.